One of my favorite comfort foods is Chicken Pot Pie. There is just something about it, the aroma and the feeling of satisfaction that it gives you in every bite. I have had a hard time trying to recreate a homemade pie that taste as good as the ones you buy in the store (Marie Callender) . For me it is usually the sauce, trying to perfect it was always so difficult for me. I was piddling around one of my favorite sites the Sunday Baker. I saw that Tanya had posted a recipe for these cute little individual chicken pot pies. Three things about this recipe caught my eye. One, the crust was made from scratch with cream cheese, two the filling and sauce looked so smooth and flavorful just like what I have been searching for. And three, Tanya stated that the recipe was adapted from Taste of Home! I love Taste of Home recipes, so you see I just knew this recipe had to be great. My husband loves Chicken Pot Pie, so I knew he would be in for a treat. I was so excited to make this recipe and get his thoughts. Off I went making the crust and filling. The crust was so easy to prepare and smelled wonderful. And the filling..... well it was DIVINE!!! I was in heaven!!!!!!!!!! I could of sat and ate that filling right out of the pot LOL. This pot pie baked up beautifully and my husband loved it. I'm so excited that to have found in my opinion to be the perfect Chicken Pot Pie Recipe. The crust turned out so flaky and the addition of the cream cheese was very awesome. If you want to save time you can purchase a store bought rotisserie chicken to save time. Just have the roasted chicken for one meal and save the leftovers to make this wonderful pot pie. You wont be disappointed. The only thing I did differently in this recipe was, I made one large pot pie instead of individual ones. I had a hard time locating the individual pie pans. I finally did at my local Kroger so I will use them next time. I also left out the celery seeds in the crust. If my kids saw those they wouldn't eat it! They would of said whats all those little spots in the pie? yuck!! I would rather just leave it out so I know they will eat it. For the crust, combine the flour, cream cheese, butter, and if using celery seed add to the bowl. Cut in the cold cream cheese and butter until you have a crumbly mixture. While I prepared the pie crust I started on cooking the chicken. If you have some leftover roasted chicken you can use that. I did not, so I just add some olive oil to my stove top grill and brown some seasoned chicken breasts. Then cut into bite size pieces. Roll out your pie crust. If using individual pans then roll out the crust and trace and cut a overlapped piece of dough for each individual pie tray. I made one large pot pie so this crust is enough to make a regular size pot pie as well. If making individual servings, you will get three servings out of this recipe. Roll out a total of 6 squares for 3 bottom crust and 3 top crusts. I roll my dough onto the roller to make it easier to transfer to my greased pie plate. To make the sauce in a saucepan, melt the butter. Stir in the flour, garlic, and spices till blended. Slowly bring a soft boil and stir constantly for about 2 minutes or until thickened. The consistency should coat the back of a spoon. Remove from heat and add the frozen vegetables (peas, carrots, celery, whichever you prefer! ), then add the chunked chicken. Fill your pie plate or individual pie pans. Bake at 425 degrees for 20 minutes for individual pot pies or until the crust is golden brown. If making one large pot pie you will have to cook it longer. Just watch the pie so it doesn't brown too quickly. Serve the individual pot pies over mashed potatoes or right out of their bowls. If the pie tins came with covers you can also cover and refrigerate the baked pies or freeze your pot pies before baking whenever you need a quick meal. If freezing, wrap the uncooked pot pies with foil and then place in freezer bags. To bake just remove from the freezer thaw a bit and bake. Or to save cooked individual pot pies let cool and cover with each individual cover the tins came with. Store in the refrigerator and then just pop them in the oven to warm up for a quick meal. I have included some pictures of the little individual chicken pot pies. Just in case you choose to make little ones instead of one big pot pie. All done!!! Perfect little pies for each person. On a floured surface, roll out the dough in to a flat square. Take one of your tin bowls and trace and cut an overlapped piece of dough. Place it into the bowl and softly press it into the corners: You will get three servings out of this recipe. Roll out a total of 6 squares for 3 bottom crust and 3 top crusts. Or you will get one large pot pie like mine. To make the filling in a large saucepan, melt the butter. Stir in the flour, garlic, and spices till blended. Slowly stir in the warm water, bouillon cubes, and milk. Slowly bring a soft boil and stir constantly for about 2 minutes or until thickened. Remove from heat and add the frozen vegetables (peas, carrots, celery, whichever you prefer!) and the chicken. Fill the pie shells, put the tops of the crusts over this and seal the edges. You can use a fork to make a fluted edge. Make a criss cross slit in the center: Bake at 425 degrees for about 20 minutes, or until the crust is golden brown. Serve over mashed potatoes or right out of the bowl. If making one large pot pie bake about 30-40 minutes. Watch it carefully so it doesn't get to brown on top. If it browns too quickly cover it with foil sprayed with non stick spray. This is so impressive! I will have to put on list of recipes to try on the weekend. Thanks! Looks fantastic! And yes, this is comfort food at its best! I love chicken pot pie. Looks like that'll be going on the to make list. Just one question- can you taste the cream cheese in the crust? I am surrounded by cream cheese haters and I know they won't eat it if it tastes like cream cheese. That looks so delicious! I agree, chicken pot pie is one of the best comfort foods out there. I love the look of that sauce, very creamy. Mmmm!!! Micha I couldnt really tell the cream cheese was in the crust. I did make it so good though you gotta add it. With all the other flavors of the pie you can even tell. I think the cream cheese makes the crust so much richer tasting. That looks really good..I put it on my must try list when the weather cools down. ack! I need that. RIGHT NOW! I love the sounds of that crust with cream cheese, and the filling looks delicious. I will have to give this a try once we get cooler weather. It's a yummy 'fall' meal in my eyes. 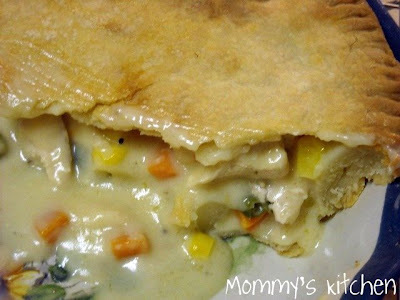 Gorgeous, I am always on the lookout for a good Chicken Pot Pie, so far I havent found one, but I will try this! Sounds way yummy! Cream cheese in the crust is a great idea! I'll have to put this on my list for thie comming Fall, I love a good chicken pot pie when the weather starts to cool a little! Thanks for asking to be my friend on Tasty Kitchen! I'll be trying this one! Looks so delicious! I've printed this one off - my DH is determined to try it (although I'll be making the pastry). As there's only the two of us, it's always a pain trying to think of something different to do with a chicken the 2nd day - it usually ends up being curry. This is great! Thanks so much. (I've also put your link on my blog under Gracious Living, Gracious Dining in the l/hand sidebar). This looks so yummy! I'll have to add this one to my menu plan soon! No wonder I love coming here. Taste of Home is some of my favorites too. This pot pie looks outrageous and with a cream cheese crust? Holy cow. We don't have pot pies here in Manila or at least they're not popular here. For comfort food, though, we have other pies that serve as comfort food. I baked this is a cast iron frying pan with no bottom crust. Since I didn't have any cream cheese, I made a regular pie crust instead. This was a fabulous meal! Amazing!! I was worried about making the dough for the crusts, but it only took a few minutes and was super super easy!!! followed the recipe and they turned out perfect!! Thank you! This is definitely a keeper!! and next time i'm making more just so I can freeze them! This is absolutely THE BEST pot pie recipe EVER! I made it one night for dinner, had everything on hand and my husband couldn't stop talking about it! We love pot pie! By the way, Walmart has the mini disposable pans...they're in the home section with the real baking sheets and pans. This is the best pot pie recipe I have ever made! The kids and I gobbled it up and I am planning on making another one tonight. The only thing I changed was I added leftover turkey instead of chicken; have to get rid of those Thanksgiving leftovers somehow. Thanks again! Hi, I have been bouncing around your site like ping pong ball. You have so many awesome looking recipe's, and they say we eat with our eyes before our mouth's. About you chicken pot pie. I have tried and was not happy with past recipe's. Here's maybe a couple of ideas for containers. We have a $1.00 store and they carry alot of different size aluminum pans. And (not sure) but if you have Corell ware ceral bowls I think they can go in the oven. I am raising my Grandson and I know he will he will proably inhale 2-3 of these for dinner.